It’s a tap on the shoulder from impermanence to say, eh, sorry, love, but you haven’t got all day. Sheesh. I know that, on your way, I’ve seen the grey hairs, the little wrinkles that he promises me he loves still. The signs to let me know that on awakening from what seems a ten-year slumber while washing the dishes and changing nappies; I’ve awoken and suddenly I’ve grown older. While sleep-depreived and breastfeeding, spoon feeding and toilet training, I had little time for watching the world or really taking as much notice as I would have liked. While I was measuring the little steps, their height on my pantry wall, their ability to reach the biscuit shelf, everything else was getting a little bit older too. You’re right, impermanence, time does not wait for any man or woman. Just show yourself out will you? They’re older now, in fact, they’re all away, at their Nana’s, two nights away and I believe I just heard silence, real silence. There it is again. No sound. No screaming or pushing, laughing, ‘I’m hungry-ing’, no falling, nobody has let the cats in or out, nobody has slammed a door. There is just me and my tap, tap, tapping and head space and oh my, do I have a lot to catch up on. And empty, the house reminds me of a frame of a beautiful picture, I mean, it’s a very fine frame, a collector’s item really, regardless of the battered edges that lend it a somewhat fine aged contour. But it is an empty picture nonetheless without the three main characters in the picture’s portrait. The little beautiful creatures who take up the foreground of the painting of our lives here. And here, listen to me, me with time on my hands, to tidy in peace, sit still, watch uninterrupted television, to read a book, feed a calf and I’m sitting here thinking of them. Time without children is time to recuperate, time to recover from the exhaustion of always being somebody’s, some three bodies mother. Where does time go? She’s off to the garden, with a beer and a little music and a bit of appreciation for the finest things in this life. In gratitude of my beautiful portrait. This entry was posted in children, City Girl, family life, Farmhouse, motherhood, Uncategorized and tagged children are away, headspace, heaven, love on May 6, 2018 by annebennettbrosnan. About now, you’ve finished early, taken the tie off, flung it on the backseat or relaxed in your casual Friday gear; you’re off to collect the kids that extra hour early. It might be a Chinese for supper, or that new Asian street food place you like. He puts that wine you like in the fridge and you buy the croissants for Saturday morning or pancakes, he makes pancakes on Saturday morning as a treat. It is, after all, the weekend. I dream of your weekend sometimes, remember, that time when, in a lifetime ago, I clocked out early on Fridays and met up with the gang after hours to exchange out of hours office gossip over cocktails and local beers. Dream of how himself might finish at five, collect the kids while I get my hair done for a night out. And so to now, how can I describe the weekend to you on the farm? What changes on the Friday, moreso, Saturday to whisper take-that-break? As usual, I can only describe this evenings scene. Friday is market day in our nearby town and myself and my almost four year old make it our business to shake hands with the fish monger (they’ve built up a friendship) and pick up enough fish to feed, let me see, two men, one woman, three boys for dinner. And then from under her awning, local farmhouse baker, Audrey, who has been up since 5am baking delicious cakes, saves me a job and I carry home dessert for after our meal of fish. The children, like yours, come home without homework and they disappear, to play, shout, cartwheel. This evening they are pirates, all three with hats on as they shout orders to each other while the cows look on, chewing their cud, happily in the sun, until the farmer and his pirates swashbuckle into the field to bring them home for milking. As to the cats, on weekdays I shoo them out, there are four, Coco and her children Hermione, Harry and Tom (formerly known as Lily) but at the weekend they remain hidden happily in various parts in or out of the farmhouse, in an available basket, basking in the sun on top of one of our collies, Sam and Pepe. I might wash the ware, or not straight away. There’s no rush, the weeks work is done in the farmhouse, I listen to my radio, light a candle, chill that wine, think about writing to you, watch my pirates as they laugh into the Kerry air surrounded by cows and cats and dogs, their family. The work really doesn’t stop but it might move down a gear, but don’t tell anyone. We continue to milk the cows twice a day, feed calves twice a day, move wires, fence, feed remaining silage to heifers, clean out cubicles for any remaining animals housed, go to the creamery for supplies to keep us going for the weekend, fix water troughs that might need mending, spread fertiliser, slurry, agitate same slurry and an innumerable amount of other chores so that we can have Sunday afternoon off between milking. Phew, you say. My friends have stopped asking, we’re not really available to meet on Saturdays but we’d love to see you Sundays. We’re great friends on Sundays, between milkings. And yes, it is difficult. But it reminds me to book a babysitter, to remind himself to finish milking early on Saturday. It is our life, one that I know, though it has it’s moments, now, I have come to love. I’ll take my chair and book and tea later and sit outside and watch all my pirates chat with their Daddy as they bring their cows in and delight in the weekend that is here. Sometimes I bring the cows in but not on Friday evenings let it for Daddy and boy time as they take off along with the cats, dogs and cows to wonder over to the milking parlour all enjoying each others company. And I breathe in the weekend and exhale the busy week that was. Another weekend on a dairy farm as I take my little break. This entry was posted in children, City Girl, family life, Farmhouse, Farming Outlook, The Living is Easy, Uncategorized and tagged children, countrylife, dairy farming, farming, the good life, weekend on April 27, 2018 by annebennettbrosnan. Sometimes, busy takes on a life of it’s own. There busy is running up the hill in front of me as I chase behind, hand out calling, limping, dragging myself to catch up. And this year is particularly so. This last week, I found myself running around finishing course work for the agricultural-course-that-would-never-end. All the while, the children fed on biscuits and binge-watched lego movies. Occasionally, our farmer would arrive at the door, equally as busy, flummoxed because someone else was looking for something for the shed-that-would-never-be-finished. Are we seeing a pattern emerging? Oh dear, the habits I’ll have to break as I put two biscuits on my own plate alongside my third cup of coffee. Himself is at the door again. Another drama. As everything is tinged with a bit of drama in the spring when you’re sleep deprived or you’re worried about an animal. Or indeed, it has been freezing and the grass isn’t growing. And it’s stressful in a farmhouse when everyone is busy. Just one more week I tell them and I’ll finish this course. And it will all be fine. And so, this evening, I chased busy up the field. Busy the errant cow as she broke through fences. Her comrades decided to follow her and what began as a gentle walk down the field to get my steps in whilst helping himself turned into a 5 K run (I did say dramatic didn’t I?) to bring in the cows who ran in search of greener pastures. Eventually, when I stopped all the hopping and cursing and roaring for himself to come down, or something along those lines, the cows, their bellies full, decided to obediently wonder up the right road on hearing their real master’s call. And so, this busy mother , now qualified farmer, slowed down to take in the view, the sunset, the lovely spring evening, slipping her hand into her farmer’s hand for a tiny stolen moment. At Easter, we rise again. This entry was posted in Uncategorized on March 31, 2018 by annebennettbrosnan. Santa Claus is most certainly coming to town; and it’s great. There’s magic in this here air; an air full of stories and wishes and remember-mommy! I want to can and save it, sell it, market it, remember it, have it seep into my very bones. The very joy of my little boys waiting for Christmas. And yes, of course it’s commercial. And of course, I’m worn out, he’s looking for such a thing and I can’t get it. And I have only so many days in town. So many hours without these boys trailing after me to fulfil a certainly magical list. But isn’t it great! It’s the good stuff. It’s like filling their little heads and bodies with as much good will and spirit and kindness as we can before the secret is out and their world becomes a little less magic. It is the essence of their childhood and we want it here in our home as long as it will stay. Because we know that every year, as they get a little older and more in tune with the world, they become more mature and thank God, wiser. They become more self contained and we’ll see them blossom in other directions, to places where we cannot go and we will wave them goodbye and watch in awe as they take flight. That’s what we signed up for right? But for now, they’re here and they want to hear ‘The night before Christmas ‘again. They want the story of how that angel ornament fell or to remember the morning Santa himself left the fire door open and let in the cold. They want snow. They want it all and we endeavour to deliver so as to have memories to warm our old bones in years to come. Being a parent of children of a certain Santa loving age is like being the footballer in his prime; loving the glory but knowing that the day too will come to hang up the old boots as the roar of the crowd fades out and the world becomes a little less magic. So we’ll see the man in the red suit this weekend and watch them, our hearts aching at the sparkle and beauty in their eyes as they try to convince this fella that they really are good. And there we’ll be, the gushing, beaming two at their side, bursting at the seams with pride, trying to capture it all so we have something to remember. This entry was posted in Uncategorized on December 7, 2017 by annebennettbrosnan. I spent the early morning sweeping up flour around the house; it was a good party. The partiers were thrown down around the living room, the worse for wear for the sugar consumed the night before. I placed glasses of water around them suggesting that maybe it would help. The morning after the Halloween night before. Luckily, halloween coincides with the father of the house coming in earlier from the farm. We’re back to milking once a day and he’s back to us. Back for bedtime, back for story time, back for crabapples and divvying of sweets post trick or treating. For daddy is the hero of our farming story and his presence always means for us; relaxation. 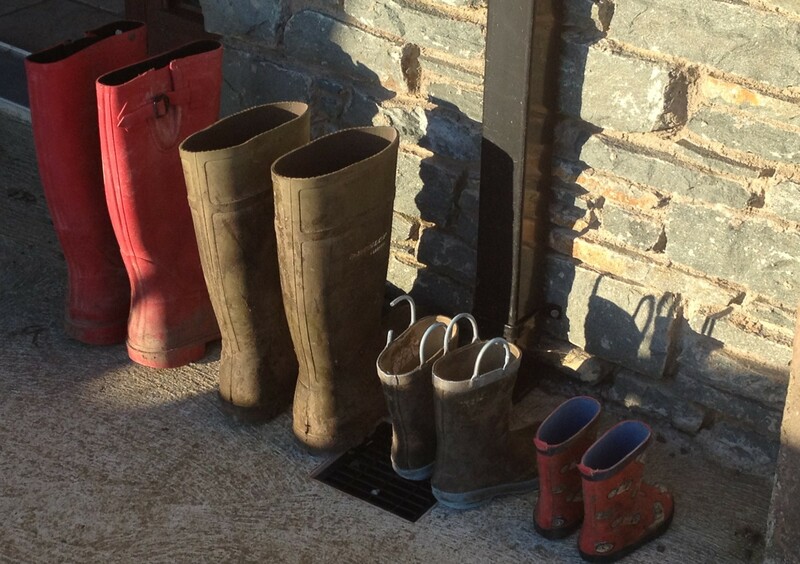 Dad leaves the farm at the front door with his wellingtons and we relax. The boys relax because they have someone else to wrestle with, to tell their stories to, to impress, to argue with. And I become a bit of a wallflower. Thankfully. I mean, I was there to put the coined bob apples in the bowl along with the grapes and nuts. But I don’t enjoy watching them (almost drown) going to the bottom of the bowl to catch their treasures. Nor do I really enjoy watching them make a mess. I have no problem contributing to the eating of the sweets and crisps. That is not a problem but I stand back and smile, edging my way to my book and hot beverage in the corner when they contemplate cutting a pile of flour in order to avoid (or delight in) dipping their faces into said flour. I’ll leave ye at it. They are all particularly good at pushing each others heads into bowls of flour I must admit. It must be a boy thing. His side. Nor do I like when the eventual sugar rush hits and I usher the wrestling mass of little men and man upstairs to continue this particular adventure. I might give the occasional roar up the stairs (my contribution to such a bedtime) when I feel that maternal guilt or the noise is such that it disturbs my radio-washing-the-ware time. Back to the sink I go. With pleasure. Eventually, I might cave in and walk up the stairs to see the farmer-hero of our story half asleep half reading to three boys as they hang off his every mumble; one flung over his shoulder, one in his lap, another under his arm as they delight in the Winter time that brings their Daddy home. This entry was posted in Uncategorized on November 1, 2017 by annebennettbrosnan.